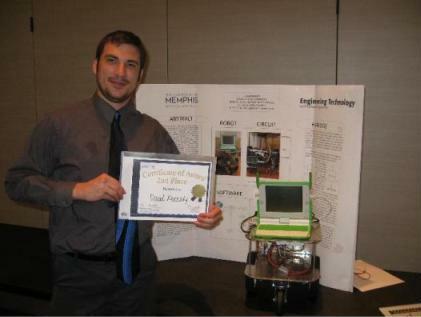 David Kennedy, now a graduate student in the Engineering Technology Department at the University of Memphis Herff College of Engineering, won 2nd place in his division at the annual Student Research Forum for his project “Mobile Robotics” in which he created an internet controlled robot using a OLPC (One Laptop Per Child) PC. He used the OLPC’s video, sound, microphone as well as it’s internet (Wi-Fi) capabilities to implement his project along with a USB Input/Output Control device to control the drive motors of the robot. This same robot was seen by visitors during our E-Day Open House back in November.